Four prominent political prisoners condemned the Iranian government's persistent violation of human rights in a letter to UN Secretary General Ban Ki-Moon during his visit to Iran to attend the summit of the Non-Aligned Movement. Heshmat Allah Tabarzadi (leader of the Demoncratic Front of Iran), Afshin Osanloo (brother of a prominent jailed bus union leader), Reza Sharifi Bokani (Kurdish human rights activist) and Khalid Hardani (Ahwazi Arab activist) are being held at the notorious Rajaie Prison in the city of Karaj, Alborz Province. The letter has been translated by the Ahwaz News Agency. Since ancient times, the Iranian people have been well known for their hospitaity, especially for an uninvited guest like you! Your title as the UN Secretary General unfortunately became the Secretary General of all governments (as we call it traditionally). You are not to be blamed but it is the result of the structure of the organisation. The countries of this organization are supposed to represent their people, so to avoid any confusion we would like to say that governments such as Iran's do not represent their own people and act against their nation's interest. By way of an overview, we would like to state that the majority of Iranian people have never been represented by their government. The Islamic Republic of Iran has never allowed any opposition political party, even peaceful ones, has never allowed political activism and the leaders and members of opposition political parties have been severely tortured, detained and executed. For example, the Iranian National Front, Iranian Freedom Movement, Iran National Party, the Pan-Iranian Party of Iran, Religious Nationalists, the Kurdistan Democratic Party, the Democratic Front of Iran, the United Student Front Office, and, during the last three years, Consolidation Office Members, the Mosharekat Party and the Revolutionary Mojahedin Organization. You arrived in a country which over the past few years has become as big prison for journalists with no newspaper allowed to work independently. It is impossible to name the number of banned newspapers in this country. 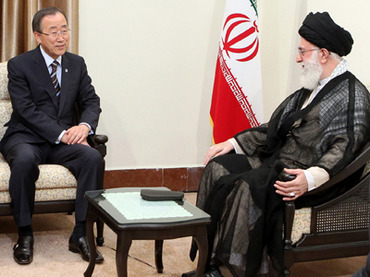 If you are interested in meeting with independent newspapers and with the persecuted leaders of parties and organisations, who remain in prison right now, would the Iranian regime allow you, Mr Ban Ki Moon, the UN General Secretary, to meet with them?! Mr Ban Ki Moon, you are in country in which there is no freedom for peaceful demonstrations or political activities that criticise the government's policies. If anyone is caught doing so, they will be accused as being Mohareb (against God) and of disrupting national security and consequently suppressed, detained and executed. You are in a country where no individual or party is allowed to choose their candidate in a general election, apart from those appointed by the government. Only candidates belonging to the Revolutionary Guard Corps (Sepah), the Intelligence Ministry (Etelaat), Judiciary, Basij and finally the Guardian Council can be allowed to participate as candidates. You are in a country where ethnic and religious minorities are not allowed to use their legal rights, as stated in the constitution, and are not welcomed and supported by the government, and due to the government's persecution of their beliefs, they are detained, tortured for years and finally executed. You are in a country where women are denied the same rights as men, and women have no right to serve as prime minister or a judge. In this country, religious, ethnic, and gender oppression, and amputation and stoning, are all legal. Mr Ban Ki Moon you are in a country where there are no human rights, as set down by the UN, and the supreme leader is Ayatollah Khamenei. Khamenei pretends he is an Islamic cleric who supports poor people in Palestine, Iraq and Bahrain, and shows his sympathy with people in the world. He sees himself representative of God on Earth and has the full power to do anything to those who oppose him. He has used billions of dollars from oil exports to strengthen security forces loyal to him and destroys critics that oppose him. Mr Ban Ki Moon you’re the guest of this theocratic dictatorship. Do you come here to ask him to be faithful to the international law of human rights, or want to legitimatise killing more political activists?! In this country, poverty, inflation, unemployment, discrimination and corruption are rife. Every year, thousands of workers have lost their jobs, factories have closed and companies have gone bankrupt. Iranian people are forced to accept and tolerate the economic effects of a corrupt totalitarian government, mismanagement and international sanctions against the government. And nobody is allowed to criticise corruption because they are oppressed. The entire world watched the government's brutal crackdown of the Green Movement three years ago. Did you see it? To be frank with you the Iranian people are not expecting you to criticize the regime's inhumanity! Because if you did so you would not accept the invitation to this conference. Mr Ban Ki Moon, there is no need to explain the Iranian regime to you, because during the last three decades it has been involved in national and international crimes such as sponsoring terrorism around the world, supported by Iran and its allies North Korea and Syria, which are also examples of undemocratic and criminal governments. Mr Secretary General, you have been asked by civilised countries to visit Iran to warn the regime about the nuclear programme. These countries are concerned about their security and stability. But the main victims of the regime's national and international policies are the Iranian people. On one hand, the regime has deprived them of all their rights and the country has became a big prison. On the other hand, the Iranian people are forced to pay for the negative consequences of the huge costs of the nuclear programme. Billions of dollars in oil sales are diverted from investing in the country and its public services into spending on investment in the nuclear programme. Also the international economic sanctions affect mainly the Iranian people. If countries such as Israel attack Iran, which we oppose, they will attack and destroy Iranian capital and investment which could support the country's young people. So, the Iranian people will bear the costs, not the regime! At the end, Mr Ban Ki Moon you are welcome in Iran and we would like to say that one day the Iranian people will stand up again, and will have a constitution following all the principles of democracy, human rights and international law, free from international isolation and playing a constructive role for peace and freedom in the world. The Iranian people do not have any conflict or enmity with any nations or governments.